Check out our searchable table for the top 100 cable originals at the bottom of the post. NETWORK UPDATE: THURSDAY NIGHT FOOTBALL adjusted up to 6.0 in final numbers (last week’s TNF final was 7.5). In addition, HEROES REBORN gained 0.1, as did SCANDAL. CABLE HIGHLIGHTS: The NFL Network part of THURSDAY NIGHT FOOTBALL topped Thursday cable at 1.40, down 0.43 from last week. 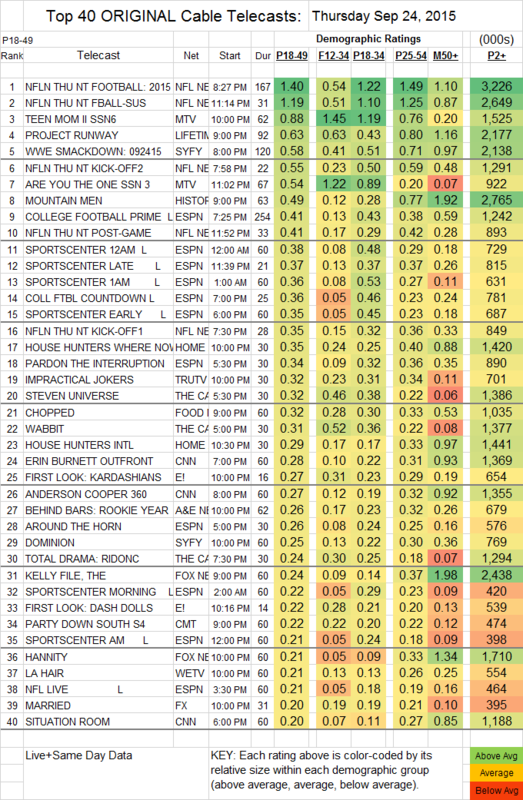 MTV’s TEEN MOM fell 0.24 to 0.88, with lead-out ARE YOU THE ONE at 0.54 (0.12 above last week’s TRUE LIFE in that slot). Lifetime’s PROJECT RUNWAY lost a tick to 0.63, but RUNWAY fans didn’t stick around for new lead-out FASHIONABLY LATE WITH RACHEL ZOE, which debuted at 0.14. On Syfy, WWE edged up 0.02 to 0.58, then DOMINION gained back some of last week’s loss, up 0.09 to 0.25, and GEEKS WHO DRINK climbed 0.04 to 0.14. On History, MOUNTAIN MEN gained 0.04 to 0.49. ESPN’s COLLEGE FOOTBALL game dropped 0.22 from last week’s to 0.41. A&E’s BEHIND BARS lost 0.05 to 0.26. REVIEW (Comedy) was steady at 0.11. On FX, MARRIED rose 0.02 to 0.20. On IFC, the 10:30PM DOCUMENTARY NOW was steady at 0.07 in the demo, although it fell by 57K total viewers to 104K, while the 10PM episode was at 0.06/109K.